Ethan Pritcher is a normal kid. Well, other than the fact that every once in a while, he switches bodies with someone else. He doesn't know how or why, he just knows that it happens -- and always when he least expects it. After trading identities with a muscle-bound movie star, Ethan finds himself in a big trouble. When he learns that a hired killer is after him, just staying alive will be a big challenge. But his sister, Madison, may have the toughest job of all. She'll have to find a way to keep the movie star, now inhabiting Ethan's body, from getting her brother kicked out of sixth grade. . . I love young adult novels however Ethan Pritcher, Body Switcher is aimed towards for an even younger crowd. I would say that it would be perfect for kids between the ages of 8 to 12. There is a lot of action to keep the younger reader entertained as well as great character development. In fact, I was really impressed by how well I got to know Ethan and Madi in such a short book. 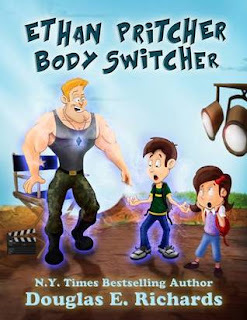 I would recommend picking up Ethan Pritcher, Body Switcher for your kids. Ethan is a very smart likeable kid who shows the value of thinking things through. I rate this story a 3.5.